Ever since the first clock was made, humans have been keeping time with this marvelous invention, ensuring one will always be punctual when necessary. But they are more than our timekeepers, these ingenious inventions can actually make awesome decorations as well. 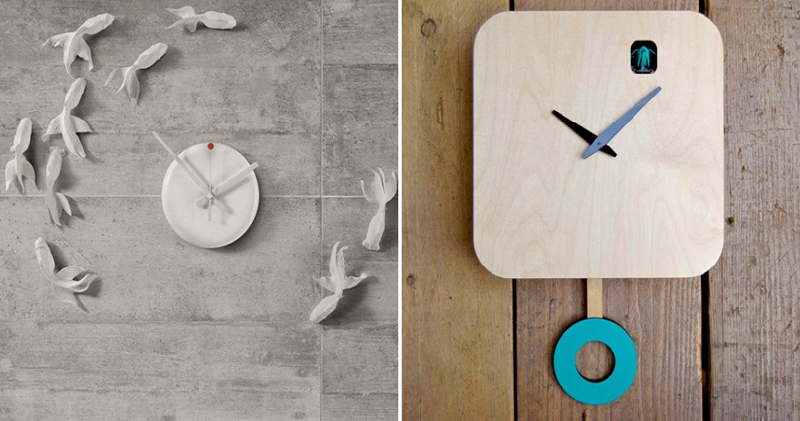 Here are some cool clocks to get you inspired. Add some creativeness to your home with this quirky fish clock which will mesmerise you and your guests. This wonderful clock is bound to make a statement in your home. Watch time literally fly by if you get this clock that helps you keep time using 12 detailed sparrows instead of the usual boring numerals. This eye-catching timepiece is a surefire ice-breaker in your home. What could be more fanciful than a watching time pass by on a quaint clock that features butterflies? Best of all, this gorgeous clock even comes in several colours for you to pick from. This is the perfect timepiece for you if you love colours, because it features all the colours of the rainbow. Add some cheer and joy to your home with this vibrant clock. If you still love traditional clocks but with a modern twist, then you should definitely go for this timepiece. Constructed out of oak, brass and wood, it will fit well even in the most elegant homes. Think out of the box with this extraordinary clock known as Continue Time that will cause guests to scratch their heads when trying to tell the time. But once you get the hang of it, it is actually really easy. Tip: The time on the clock is 3:40:05. Are you a math geek or just born to love numbers? Then you should really consider getting this clock which requires some brain juice before you can figure out the time. This incredibly ingenious clock utilises 3D movement connecting the two hands to tell the time. This ever-changing clock may seem complicated at first but it is actually super easy to understand. The perfect addition to your kitchen, this clock will make sure that you will always remember when is the time to eat your meals. Just looking at the clock makes me hungry already! Don’t like to be always reminded of the time? Then you should consider getting this clock, which remains blank until you press gently on the surface and then the time will show. This sleek clock reminds you how much time you have left in a day as the bar will slowly change colour until it reaches the end of the day. It even looks like a piece of art itself. This design gives a really good update to the traditional cuckoo clock that we all know and love. The wooden exterior with its clean lines and striking pendulum adds more warmth and character to the room.